Brambles (or Blackberry bush) are long thorny tangling shoots which grow to around 6-8ft in length. Brambles are a frequent problem, especially in neglected areas. While their flowers & fruit are excellent for the environment, sometimes it is necessary to have to remove them. 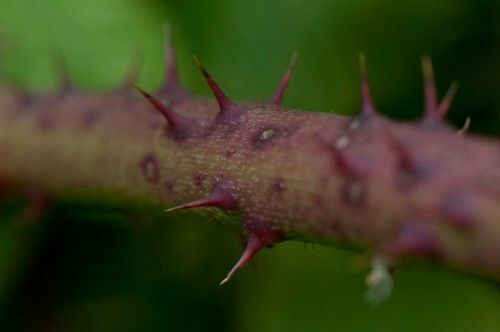 Brambles are easily recognized with long stems with thorns on and will also contain Blackberry fruits through the summer months which can range from red to black. Brambles can be a frequent problem especially when they are left untreated and left to grow in neglected areas this can be in places such as untouched gardens and dense woodland. They can quickly swarm over wanted vegetation and their roots can damage other plants or structures. If brambles are caught early, it is possible to control them by hand by cutting back and digging out. However, for a faster, deeper kill we would recommend a targeted treatment of herbicide. You are limited with what products will be effective on Brambles, although we have two options that are suitable. For ‘bare areas’ or unwanted vegetation use a total weed killer such as ‘Diamond’. If you are spraying within grass you will need a powerful selective weed killer such as ‘I-cade’.